When large corporations such as Nestlé hold public events, one generally expects them to be a product launch ceremony. That is why when Nestlé invited bloggers from Lahore on 17th of October for an event that was more of an awareness session, I was met by surprise. No Nestlé products were put on display, neither did any of the organizers or the speakers encourage the audience to buy certain Nestlé products. 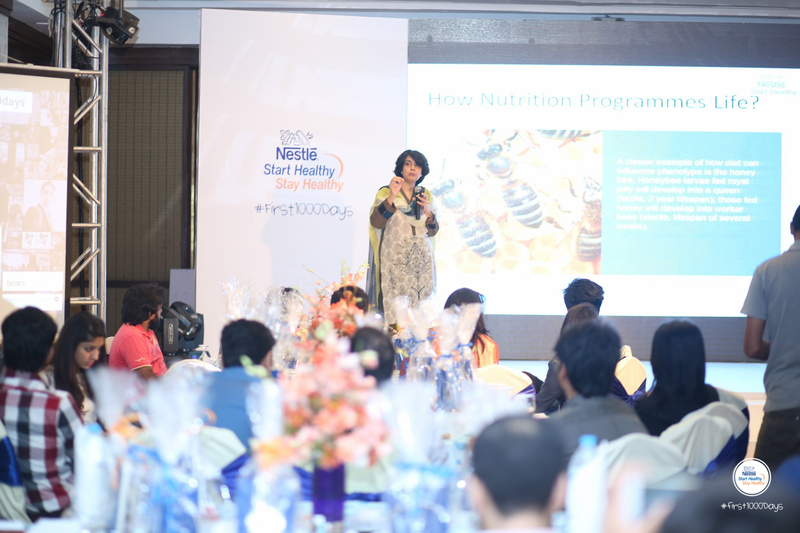 Titled “Start Healthy, Stay Healthy: #First1000Days,” the event organized by The Digital Factory presented the general public with an opportunity to learn about infant nutrition, from the child’s first day in his/her mother’s womb. It was emphasized that a child’s basic nutrition starts before being officially born. Dr. Huma Fahim, who is Nestlé Pakistan’s medical adviser, and Shah Majeeb-ud-Din, the company’s country compliance manager, explained several things about the role of a mother in a child’s early growth, strongly emphasizing on the point that breast milk is the best food for the babies. Besides strengthening their immune system, it also helps in developing strong bones among other things. Scientists and nutritionists all over the world recognize the significance of breast milk in a child’s early growth. It was further discussed how the traditional lifestyle of Pakistani mothers adversely affects their children, adding that the average height of Pakistanis has fallen by four inches in the last four decades. Meanwhile, obesity has also increased by alarming levels, with Pakistanis now being the 9th most obese nation in the world. Attendees pose for a group photo. The presentations were followed by an interactive Q&A session during which several myths were discussed (and discarded) and other queries by bloggers were answered by Dr. Huma. Overall, the event was a success and it showed Nestlé’s dedication towards making a positive contribution in the society by educating the public about basic things we often do not pay attention to.